Five awesome DIY Kids’ Valentine’s Day Cards you haven’t seen 100 times already. Ah, Valentine’s season. Another opportunity to feel insecure about your creative parenting skills because your kids Valentine’s Day cards are store-bought (me). Well, don’t fear. I’ve come up with a list of 5 cute AND easy AND cheap cards that will cut the muster. And I’m confident about this because I got them all from Pinterest. So there. Enjoy! PS: See all of our fave valentine’s cards on our NEW Pinterest page. 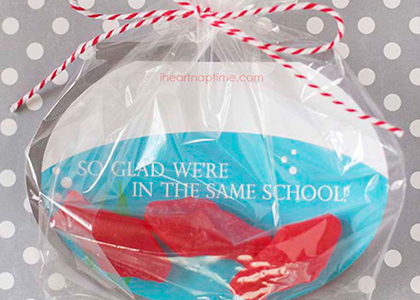 These Swedish Fish valentines are too cute! The homemade treat cards are easy to make with downloadable PDFs and plastic bags, ribbon or string, and candy or cracker fishies. See the rest of the post on iheartnaptime! to learn more on getting started. I love this one because it’s so pretty and girly, and so so so easy. Just cut out a bunch of tissue paper circles and poke a lollipop through the middle. And not to give more props to the dollar stores (but why not? ), you can buy multi-color packs of tissue paper for $1 each. See the step-by-step instructions from The Frugal Mama. Jump on the trendy Mustache Bandwagon with these adorable foam add-ons. Read more how to create these gems at Spoonful.com. See here for a mustache and lips printable template. I love these because it’s not candy and honestly, what kid can refuse a glow stick. Mesmeriziiiiing. You can buy a pack of 5 sticks at one of those dollar stores making this a very economical choice. You can download and print out the heart tag from the creator, The Teacher Wife. Ok, ok, this idea’s been around the block once or twice but I was drawn to this particular one because it’s from blogger Rage Against the Minivan and the post was titled “the slacker mom’s guide to homemade photo cards for valentine’s day”. The whole thing is simpler than you think and total cost was about $7 for the entire class. See the entire article here. Do you have a cute DIY Valentine’s Day idea? Share it with us!